Florida Data Cabling is proud to work with Plantation businesses in providing professional, reliable network cabling solutions. Our business is understanding and building complex, reliable, secure network services to meet the needs of South Florida businesses. Our satisfaction comes from seeing the role that our network wiring services play in helping businesses in the South Florida area thrive and succeed in a competitive marketplace. We have had the pleasure of working with hundreds of businesses in South Florida. We have worked in centers of business and industry like Miami, West Palm Beach, and Fort Lauderdale. Our technicians are known for bringing the same level of detail to their projects whether they are large or small. In Plantation we have garnered a reputation for designing and installing scalable structured cabling solutions. We are happy to bring our services to businesses of all shapes and sizes throughout South Florida. Our technicians specialize in installing Cat3, Cat5e, and Cat6 data cabling. If your business needs help with its network cabling, data wiring, phone wiring, or phone cabling, we are the expert you should contact. Our work is guaranteed. You will be satisfied with the services we provide. We are a full service structured cabling company. This means that we will supply the cables and parts needed for termination. We can work with you in the planning and designing your network wiring system. Our technicians will install the cables, terminate them, and test the system to make sure that everything exceeds your expectations. We have had the experience of working with large call centers, data centers, centers of education, as well as with the manufacturing and industrial sectors. We are comfortable working on large jobs that require hundreds of cable drops. We eagerly accept small jobs that require a handful or even one cable drop. We work with IT companies in South Florida and are happy to work alongside your IT department. In addition to installing structured cabling systems, our technicians are experts at troubleshooting and repairing problems with your current network cabling system. When there is a problem with your network cabling, it can bring to your business to a halt. Network cabling problems, phone wiring problems, or challenges with your phone cabling can interfere with communication, access to the Internet, and the functioning of POS systems. 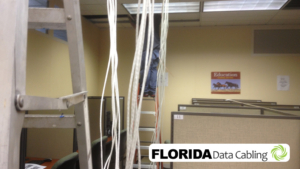 Florida Data Cabling can be your network cabling emergency buddy. Let our expert technicians get your business up and running again. We can focus on maintaining your networking system so you can focus on running your business. Over the years, we have garnered an amazing reputation in the world of data and voice cabling in South Florida. We promise that our jobs will be delivered on time, on budget, and with minimal disruption to your daily business operations. Contact us today. Let us provide you with a free estimate.